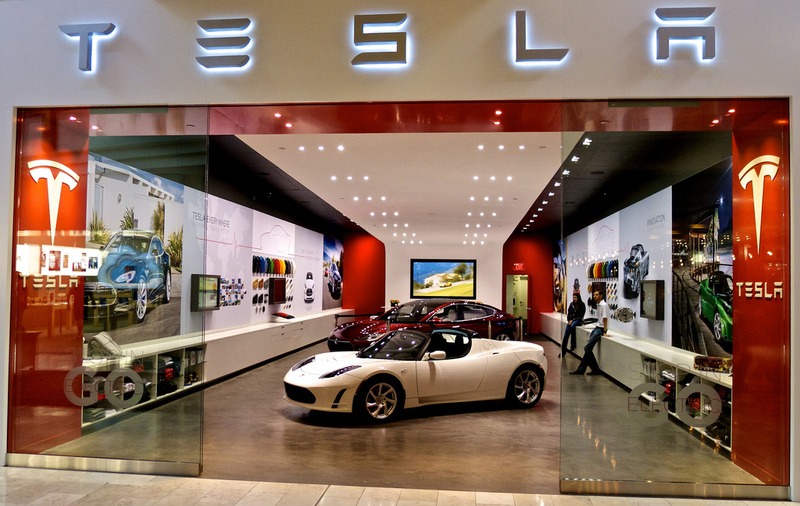 Ever wonder why electric sports car maker Tesla has carefully avoided the word “dealership” in describing its stores? Turns out 48 of the 50 US states have laws in place restricting or prohibiting automakers from selling cars directly to consumers. This is why almost every car dealership in America is independently owned and operated. Tesla’s, however, are owned and run by Tesla itself. Now the company is being challenged in four states– Illinois, Massachusetts, New York, and Oregon — by dealer groups (and in Illinois, by the Secretary of State). The EV startup currently operates in 10 states and the District of Columbia, with 17 showrooms, and another 6 opening this fall. Tesla’s showroom experience was developed by its vice president of sales, George Blankenship– a former Apple executive who built Apple’s amazingly successful, product-focused, soft-sell retail experience and aims to recreate it at Tesla’s new stores. Will Tesla succumb to the pressure and sign on traditional car dealerships, or will it continue to forge its own path? Read on after the break. Is it time to change how cars are sold? Car dealer franchise laws in the U.S. date back to over 70 years ago, when dealers with local political clout began to successfully lobby for them (in some states, there are even criminal penalties for selling a new car to anyone outside of a franchised dealership!). There were several reasons for the laws at that point– one of which, ironically, was to give smaller automakers a fighting chance against the established manufacturers. Now the laws are having exactly the opposite effect. Tesla’s sale model is much more in line with how most other industries have evolved. In the consumer electronics space, for instance, the place of purchase is no longer important, especially as more commerce shifts online. The product branding, usage experience, and service/support are handled by the manufacturer, rather than the retailer– yielding great benefits for both buyers and manufacturers. The auto industry, by contrast, is stuck in a century-old business model that pits manufacturers against their own dealers (one of the reasons GM went bankrupt was to escape the chokehold of its own dealer network) and incentivizes screwing over the customer (dealers make most of their money on service and repairs, rather than new car sales). Compare buying an iPad at an Apple store, or an Xbox at a Microsoft store, to what happens when you visit a car dealership. You can walk into an Apple store and just fiddle with apps on an iPad, no questions asked, or talk to an associate who’ll show you how the tablet works and answer questions, without pressuring you to buy anything. Same thing for Xbox at a Microsoft store– you can go and play games on an Xbox and Kinect, then walk out without any hard-sell. The prices are laid out in plain sight, and the companies try to demystify anything that might obstruct the consumer experience. Then walk into a car dealership and you’re transported back to the Paleolithic era. You can check out cars on the showroom, but you won’t be kicking the tires too long before you’re hounded by a salesperson with little in mind besides quickly closing a deal. Alternatively (at busy, high-end, or inept dealers), you might just be ignored until you find and convince a salesperson to talk to you. Once you do start talking to a salesperson, it’s too often a game of smoke-and-mirrors– complicated options packages and explanations, unclear pricing, hidden details and fine print, and a general zero-sum approach to the deal. Why should carmakers, dealers, and governments care? The car industry faces great long-term challenges– one of which is that young people just aren’t buying cars anymore. 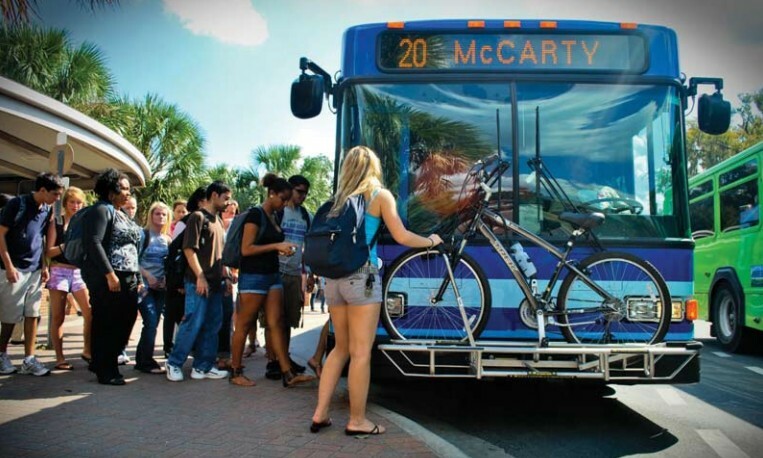 And it’s not only because they’re buying iPhones instead– young Americans are actually turning to other forms of transportation (and most concerningly for automakers, those with the highest incomes are turning away from cars the most). One contributing factor is the poor buying experience– getting a car should be more like picking up a smartphone than buying a house. These problems are hardly just the dealers’ fault– indeed, much of the system works this way because that’s how automakers have operated for decades. But without being subject to competition from new automakers, new business models, and ultimately new ways of “consuming” the car itself, the industry will fall to the wayside faster than either auto or dealer executives realize. The tech industry — which now reaches more customers than automakers ever have, and much more profitably (and not to customers’ detriment) — is defined by a continuous cycle of creative destruction that makes it ever more relevant in our everyday lives. It seems preposterous 60 years after the fact that a U.S. Secretary of Defense once said, “What’s good for General Motors is good for the country” (well, sort of). But just 5 years after the fact, it seems equally absurd that MySpace once had more users than Facebook. It’s also not just a question of eliminating dealers or cutting their bargaining rights. Yes, the shift towards direct and online sales will reduce independent dealers’ role in each sale, but why can’t today’s dealers become part of tomorrow’s solution? Imagine car sharing or other new hub-and-spoke mobility services, where dealers can become spokes. Or maybe they can be hubs for networks of smart charging stations. Or even, if carmakers wanted to get creative, local logistics points for any number of online transactions (look at how UPS has transformed itself– it now even repairs the computers it used to only deliver). Just as the tech industry is moving from one-time sales to more desirable subscription (or “freemium”) models — think SaaS (software-as-a-service) — so, too, could the auto industry. These ideas may seem far-fetched — and indeed, an average car dealership wouldn’t be able to pay its rent if its management thought only about “future mobility solutions” — but they’re probably closer to what the future will look like than today’s car showrooms. Even if evolution does mean that today’s independent car dealers — like yesteryear’s independent typewriter dealers — must give way, what’s wrong with that? From a policy perspective, why should the government protect antiquated, inefficient business models? Yes, many car dealers are (fitting the current political buzzword) “small businesses,” but so are any number of other possibly-past-their-prime businesses. Should we set up legal barriers protecting them all? Government regulations need to look to the future — or at least get out of its way — rather than chaining us to the past. We should encourage automakers to adopt new business models that benefit consumers, rather than attempt to preserve the very same system that Henry Ford used to sell Model Ts a century ago.